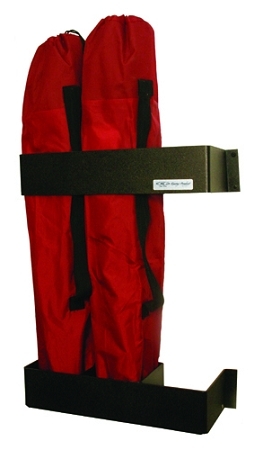 Each Standard or XL chair wall rack holds 3 regular-sized collapsible chairs. Standard: 21.5"W x 4"H x 6.5"D, weighs 2 lbs. For chairs measuring approx. 6" x 6" when closed. XL: 21.5"W x 4"H x 6.5"D, weighs 2 1/2 lbs. For chairs measuring approx. 8" x 8" when closed.